Google Fonts Blog: Kickstart new fonts! - a popular way to fund creative projects. Each month there are many typeface designs proposed to our team for publication and financial support. But we can’t support everything! Even with the best quality proposals, it can be hard to decide about those that are quite similar to ones already published. Really the best judge of which web fonts you want to use is you! So we invited the designers of three recent proposals to try out Kickstarter and see how it works for font projects. There are some fun rewards for pledging a contribution so click through to see the details! First is Marcello Magalhaes’ Folk, which transforms the vernacular lettering of Sao Paulo into a font. Already popular as web font, it has been used by The Independent Film Channel and Mozilla - but it only includes an uppercase set of glyphs, and not all the symbols and accents that Google Web Fonts requires. For this project, Marcello will complete the font to the Basic Latin character set, and has designed a poster to go with the new release. Fast Brush Script is the working name for a font by Pablo Impallari. Pablo's first font, Lobster, is one of the most popular Google Web Fonts, having been served over 2 billion times. Pablo is offering a very unusual reward - choosing the name! Normally the name of a font is sacred to the designer, but Pablo is opening up the opportunity for corporate patronage of his work. The development name 'Fast Brush Script' reflects the core concept of the typeface. This font is currently in an early development stage with the lowercase letters now fully prototyped, as you can see above, and you can download the current develop version from the Kickstarter project page. Montserrat is an extremely high quality sans serif text typeface by Julieta Ulanovsky. 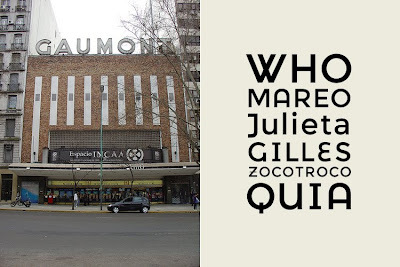 Advancing substantially during her studies at the prestigious University of Buenos Aires' Masters degree in Typeface Design, the design revives the historical type of the Montserrat neighbourhood where Julieta lives and works. This genre of type has been a popular trend in recent years and this typeface in particular stands out with its excellent quality. Setting it apart are the set of alternative caps, which add a little fun to a very functional text typeface. The Google Web Fonts team has already contributed directly to these Kickstarter projects, and we hope you will also become a backer for all three projects as well - let's hope the type designers will be paid far beyond their minimum funding goals! Update: When fonts are made available in Google Web Fonts, all their source files are also available from the 'Google Font Directory' Google Code Project in a Mercurial version control system, under a free, libre and open source license - typically the SIL Open Font License. Google Web Fonts is proud to announce a new funding experiment, using Kickstarter - a popular way to fund creative projects. Too bad we can logon on KickStart with a facebook account but NOT with a Google account. I hate logon with my facebook account because the sites, in general, ask for as much permission they want, and not the permission they really need on our facebook account personal data. Will you publish the source code to these fonts under a free license in a version control repository? Google's throwing money around left and right, but is seeking funding for a few fonts? This is weird. Wait, are you saying that Google, one of the wealthiest tech sector companies in the world, has to hold what amounts to a bake sale just to raise money to pay a few typeface designers? Didn't you just pay a type designer close to $80,000 to design Roboto for your mobile platform? So ... why are you now so stingy? This is just astounding to me. Google doesn't want to buy these fonts. They want you guys to support the Font Community. Supporting the font community is a good thing. These aren't fonts Google is trying to publish- they are fonts that were proposed to Google by Font Designers. It says that in the 3rd paragraph. ehhhh what?! Google asking me to pour money into a Kickstarter project of them?!?! Pay those type designer and stop looking ridiculous! Hi, I'm Pablo Impallari, font designer. The Kickstarter founding is not only about paying for a few fonts. It's really about building a community around LIBRE fonts. If more and more people get used to support font designer, we can keep releasing great LIBRE fonts for ever, instead of selling on MyFonts or any other reseller. Also, this kind of projects are a wonderful way to get to know a lot of cool people! Would it be posible to use fonts from sites like http://openfontlibrary.org/ as they appear to have the same license? Our teams cordially feel immense pleasure to welcoming you all the official page of Nepal Base Camp Treks (P) Ltd, a premier local travel and trekking operator based in Kathmandu. After long experience in Tourism Sector and being a government registered trekking company, Nepal Base Camp Treks takes pride for being recognized by national and international organizations, currently affiliated TAAN (Trekking Agencies Association of Nepal), NTB (Nepal Tourism Board), NMA (Nepal Mountaineering Association), PPN (porters progress Nepal ), FNTN (Federation of National Tourism Nepal ), Kathmandu Environmental Education Project (KEEP) and IETS (International Eco-Tourism Society ),. Moreover, our company is featured in and highly recommended by much-acclaimed Trip Advisor as well. Based in Kathmandu, we have been successfully operating a number of reliable travel options for various trips to all Nepal Himalayas as, Everest Base Camp Trek, Everest Chola Pass Trek Gokyo lake Valley Trek, Annapurna Base Camp Trek, Ghorepani Poonhill Trek, Annapurna Circuit Trek, Langtang Valley Trek, Helambu Circuit Trek, Manaslu Circuit Trek, Upper Mustang Trek, and neighboring countries Tibet and Bhutan. Since the inception, we have been largely providing our valuable clients with opportunities for Sightseeing Tours, City tours, Mix Cultural Trekking Tours, Cultural Tours, Pilgrimage Tours, Tea House Trekking, Camping Trek in High Himalayas and Mountaineering, and all other sort of outdoor adventure trips inside of Nepal Himalaya. Decade 16 year’s long experienced in Tourism industry has taught us a lot to excel up to be one of the your most trusted trekking and travel operators of Kathmandu Nepal. The primary reasons behind this trust and success are the way we serve our clients and the way we've been organizing every sort of trips. The safety, security, and satisfaction of our clients have always been of paramount importance to us, and we're never saying in words only we do in practical way. Our teams keep receiving huge appreciation from our valued clients from all around the world, which we think, is our guiding light to make best out of your future trips. Humbly if you are planning your next holiday in Nepal Himalaya, let us know, we would like to help your plan and organize your life-defining trip under your feet and memorable being a government registered trekking company, Nepal Base Camp Treks takes pride for trekking in nepal, and goverment resgister trekking company in nepal being recognized. Exploring Sherpa traditional villages enriched with Buddhist culture and custom. beautiful alpine rhododendron and pine forest to barren and remorseless ice-fields. Everest Base Camp trek, one of the most famous and popular trekking destination around whole Himalaya and probably on this globe. Adventure Great Himalaya Treks & Expeditions presents this delightful and adventurous Everest Base Camp trekking where you can release yourself with amazing sceneries of mountains that surround you along with great hospitality of Sherpa the Highlanders of Himalaya, including utmost service of Adventure Great Himalaya Treks & Expeditions expert guides and staff. Adventure Great Himalaya (P) LTD Can be your best Company for organizing to your Everest base camp trek. everest base camp trek Nepal is know as EBC Trek, the trek starts from Lukla after 45 scenic flight and continues through Namche Bazaar and enters into Khumbu region. Everest Base Camp gives the wonderful experience of Tibetan culture in high elevation , pleasantly colorful views of rhododendron fir forests and massive of outstanding Himalayas views including world highest peak Mt Everest. Trekking in Nepal is paradise for trekkers. For the backpacking wilderness and organized trekking to the Himalaya, Nepal offers unlimited attractive trekking routes for the trekkers to enjoy and rejoice. Snow capped mountains, green lush forests up in the hill, ever flowing glacial rivers, laid back rural human settlement and the pristine hospitality are gearing up for the trekkers to get enthralled and hypnotized by its mere beauty. The uphill and downhill crossing numerous rivers passing by the passes and villages would treat you with the trekking to the fairyland. The major trekking routes of Nepal are the Everest region, Annapurna region, Langtang region, Manaslu region, Rara region, Upper Mustang region and various off the beaten adventure trails. Car Hire Nepal, Tourism is one of the major industries in Nepal which make offer an opportunity to see the beautiful scenery and the wonderful scenery of the mountain. We are famous for fast, secure and efficient door-to-door service. Renting the car in Nepal provides you freedom and flexibility wherever you traveling. It is providing the best service along with the less fare and better service. During the journey is seriously valuable for us about their comfort. Nepal is an ancient country with many attractions for travelers. Car Rent in Kathmandu, We are famous for fast, secure and efficient door-to-door service. Renting the car in Nepal provides you freedom and flexibility wherever you traveling. It is providing the best service along with the less fare and better service. During the journey is seriously valuable for us about their comfort. A Nepal tour has the cheapest service in Kathmandu. We are proud to offer the visitor with the affordable bus fares along with the stander and comfortable service. Car Rent in Nepal, Car Rent in Nepal provides all types of the transportation within Nepal which includes Car, jeep, and tourist bus. It focuses mainly on providing the service in the capital city of Kathmandu. There are no drive yourself rental car available in Nepal but you can easily hire cars with drivers. This is one of the best and trusted rental car services in Nepal. We offer wide range vehicles service and luxury transportation service. The mountainous terrain and winding roads restrict the average driving speed of the vehicles to less than 40 kilometers per hours. Vehicle in Nepal provides you freedom and flexibility wherever you are traveling. When you rent a car with Six in Kathmandu Nepal where you won’t have any regrets. You may ask our driver if you want to stop for a while if you want to have lunch or tea or rest during your driver. Rent a Car in Nepal, Our objective is to continually improve the car rental service in Nepal while offering our customers a cost-effective service. They have proven to be the most efficient and reliable in the condition of Nepal. The service provided by the Kathmandu car rental will surely provide you better feel and comfort ability. Hiace Rent in Nepal, It is providing the best service along with the less fare and better service. During the journey is seriously valuable for us about their comfort. A Nepal tour has the cheapest service in Kathmandu. We are proud to offer the visitor with the affordable bus fares along with the stander and comfortable service. This service offers you a wide range of great deal and services whenever you want to rent a car.